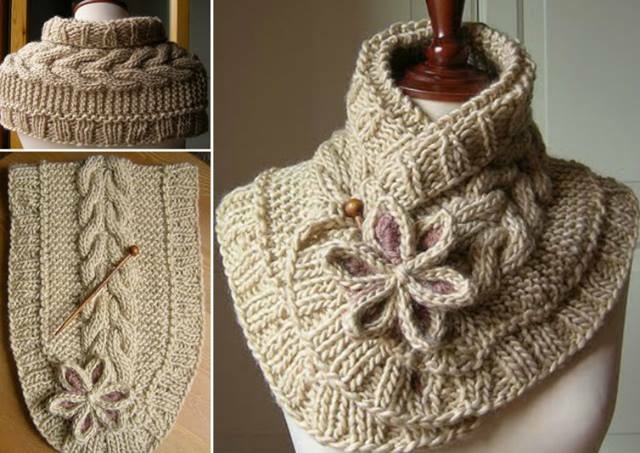 This is the most beautiful cable knitted scarf you will ever find! with pretty moon flower for decoration. It will be a warm and cozy addition in cold weather. See the knitting steps and make one for you. This Knitted Moon Flower Scarf will make a wonderful stylish addition to your wardrobe. Check out the FREE Pattern now! Description: cast on 12 stitches. Turn your work over. Row 3/ slip the first stitch, 12 purl stitches, 1 knit stitch. Total 14 stitches. Row 4 RS/ slip the first stitch, cross yarn over, 12 knit stitches, cross yarn over, 1 knit stitch. Row 5/ slip the first stitch, 1 knit stitch, 12 purl stitches, 2 knit stitches. Total 16 stitches. Row 6 RS/ slip the first stitch, 1 knit stitch, cross yarn over, 12 knit stitches, cross yarn over, 2 knit stitches. Row 7/ slip the first stitch, 2 knit stitches, 12 purl stitches, 3 knit stitches. Total 18 stitches. Row 8 RS/ slip the first stitch, 2 knit stitches, cross yarn over, 12 knit stitches, cross yarn over, 3 knit stitches. Row 9/ 4 knit stitches, 12 purl stitches, 4 knit stitches. Total 20 stitches. Row 10 RS/ 4 knit stitches, cross yarn over, 12 knit stitches, cross yarn over, 4 knit stitches. Row 11/ 5 knit stitches, 12 purl stitches, 5 knit stitches. Total 22 stitches. Row 12 RS/ 5 knit stitches, cross yarn over, slip 3 stitches to cable needle before working (hold at front), make 3 knit stitches, make 3 knit stitches from the cable needle. Slip 3 stitches to cable needle (hold at back), make 3 knit stitches, make 3 knit stitches from cable needle. Cross yarn over. 5 knit stitches. Row 13/ 6 knit stitches, 12 purl stitches, 6 knit stitches. Total 24 stitches. Row 14 RS/ 6 knit stitches, cross yarn over, 12 knit stitches, cross yarn over, 6 knit stitches. Row 15/ 7 knit stitches, 12 purl stitches, 7 knit stitches. Total 26 stitches. Row 16 RS/ 26 knit stitches. Row 17/ 7 knit stitches, 12 purl stitches, 7 knit stitches. Row 18 RS/ 26 knit stitches. No more increasing stitches. Rows 19-21 like row 17. Row 20 like row 18. Row 22 RS/ knit like row 12 but without increasing. 5 knit stitches, slip 3 stitches to cable needle before working (hold at front), make 3 knit stitches, make 3 knit stitches from cable needle. Slip 3 stitches to cable needle (hold at back), make 3 knit stitches, make 3 knit stitches from cable needle, 5 knit stitches. Knit odd rows like row 17, and even rows like row 18. Every 10th RSR is like row 22. Knit until you get the length you need. Finish the scarf the same way, but instead of increasing stitches, you decrease (2 stitches together). Once you finish knitting the required length, cast on elastic in rounds around the edges: 2 knit stitches, 2 purl stitches (make sure that the elastic closes up). Cross yarn over on the slanted edges, and knit 7-10 rows (optional). Bind off all stitches.